Adobe Flash Player is a cross-platform, browser-based application runtime that provides uncompromised viewing of expressive applications, content, and videos across browsers and operating systems..
SOLAR-JET aims to ascertain the potential for producing kerosene from concentrated sunlight, CO2 captured from air, and water. 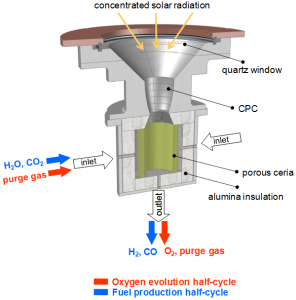 SOLAR-JET will optimize a two-step solar thermochemical cycle based on ceria redox reactions to produce synthesis gas (syngas) from CO2 and water, achieving higher solar-to-fuel energy conversion efficiency over current bio and solar fuel processes. A novel approach that focuses on assessing the technology potential, chemical suitability of the fuel, and economical and technological scalability. Schematic of the solar reactor configuration for the two-step solar-driven thermochemical production of fuels. It consists of a cavity-receiver containing a porous monolithic ceria cylinder. Concentrated solar radiation enters through a windowed aperture and impinges on the ceria inner walls. Reacting gases flow radially across the porous ceria, while product gases exit the cavity through an axial outlet port. Red arrow indicates ceria reduction (oxygen evolution); blue arrow indicates oxidation (fuel production). A far-reaching alternative towards the production of carbon-neutral kerosene from CO2 captured from air, water, and solar energy. Demonstration of pioneering processes for risk aversion in high-impact strategic long-term investments for the aviation energy future. Demonstration of the key technological components for solar aviation “drop-in” fuel production that enables the use of existing fuel infrastructure, fuel system, and aircraft engine, while eliminating the logistical requirements of biofuels, hydrogen, or other alternative fuels.